We actually have them eating together. In the past, Stewart had a problem with that. 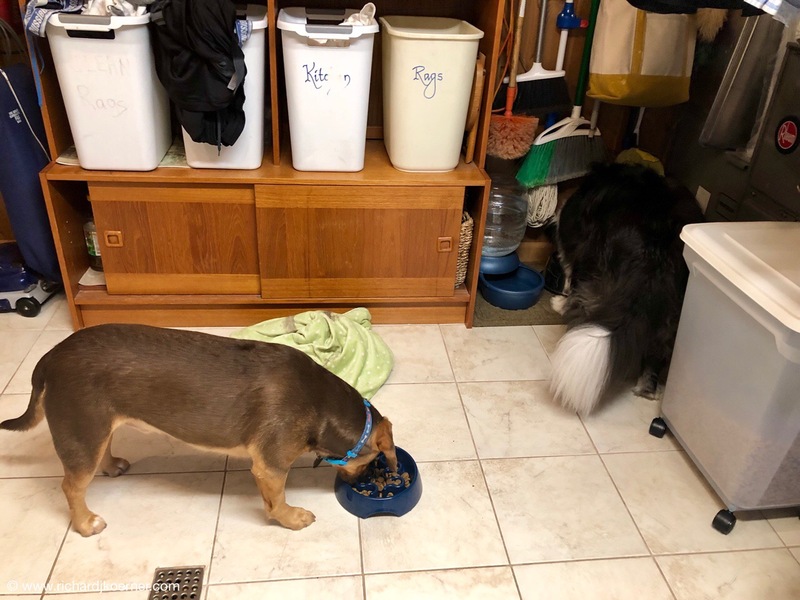 Stewart was quite happy to see his canine cousin, Lucky who is having a sleepover with us tonight while his human parents have an overnight stay in Milwaukee. Lucky was at the ‘Barking Lot’ while we were meeting friends at ‘That Little French Guy’ in Highland Park. We had a great time. We had croque-monsieur and croque-madame sandwiches and salads, as well as other French sandwiches, and then hit on the desserts that are offered: une tarte au chocolat et au caramel (basically a chocolate tart), une tarte au citron (a French lemon meringue tart), un Paris-Brest (called a Paris-Highland Park and made with praline cream), and a flan Parisien (a slice of Parisian custard tart). Needless to say, we all were pleasantly full as we had each had small pieces of the wonderful desserts. The rest of the afternoon, after we departed from our friends, was spent with our youngest granddaughter. We picked her up from her home and went from there to the grocery store, to pick up some things we needed. Then we picked up Lucky from his dogsitting situation. We came home and had a tea party, making some lemongrass tea as requested by our granddaughter. We spent the afternoon playing outside and doing things in the house. Candyland was among the things we did. We had dinner and then we took our charge home. What a nice Saturday afternoon! This entry was posted in Dogs, Life in general, Thoughts and philosophy, Uncategorized. Bookmark the permalink.